Our Affiliate is proud to advocate for this legislation, sponsored by New York State Senator Neil Breslin of Albany and Rensselaer Counties and New York State Assemblywoman Crystal Peoples-Stokes of Erie County. 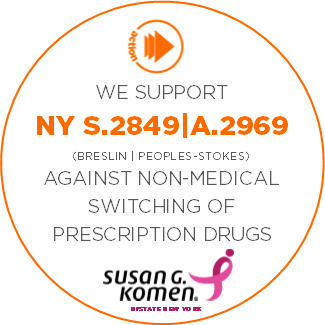 This bill ensures that all prescriptions breast cancer patients are currently taking will remain at the same formulary level and cost throughout the contract period. Consumers who buy a health insurance plan based on a specific drug formulary are often patients with chronic illnesses, such as breast cancer, that have worked with their health care team to find the best treatment plan for their specific needs. Mid-year, non-medical switching takes treatment decisions out of the hands of doctors and patients and is not based on what is medically best for the patient.